A few days after his last Sunday we flew to Colorado and just got home a couple of days ago! God provided a house for us to stay in for over three weeks in the beautiful Rocky Mountains with no plans and no agenda. Amazing. Precious. Glorious. We spent those weeks simply being together, doing whatever we wanted, listening to the Lord, re-connecting with each other and with long-time friends, doing our own thing on our own timetable, going to a church where we knew no one and going to a church that a friend has planted in the Denver area. It was the first time in over four decades that we have had more than one Sunday off. Amazing. Precious. Glorious. When got home Saturday night the decision as to where to go to church came up once again. Where do we go? Honestly, this week was easy. It was Ernie’s birthday so we would go to church with our daughter and her family. Makes perfect sense. We will worship together and then to go lunch together and celebrate his birthday. It was while we were walking in to that church that so many benefits of this ‘season of retirement’ flooded my mind! 2. We drove to church together. 3. We walked in to church together hand-in-hand. 4. We sat together and worshipped together. 5. We were not the last people to leave and he did not lock the doors. 6. That night I was not stressed about who was or was not there or what so-and-so said or did not say! Now I am fairly certain that for some of you these are “normal” things that you get to do every Sunday. You always sit together in church and drive together to church, etc. but for us….this hasn’t been the case. Therefore, it is Amazing. Precious. Glorious. Needless to say, so far this ‘retirement’ has been great! I have loved having my husband around….granted we are theoretically only on day two of the real ‘retirement’ world….but so far, so good! Amazing. Precious. Glorious. Last week my only grand daughter turned one year old. Being the awesome “Vivi” that I am, I hustled around consulting with my daughter-in-love on birthday plans. I am a PRO at planning birthday parties for my two grandsons ages five and two so how hard could a “girl” party be. I pulled down the lamb cake molds which my mom used to create beautiful first birthday cakes for all her grandchildren. I had used them twice before for my grandsons’ parties so a third attempt would be a breeze. My daughter-in-love agreed to an all PINK Princess party complete with a tiara and a sash. After raising two sons and having two grandsons, a splash of pink would be a blast. Sadly, after two attempts on the Lamb Smash Cake, I finally managed to ice a “rough” looking creature. I wanted my little princess to have a perfect cake. Instead, she got a cross between “roadkill and an ugly dog.” Oh well, I tried. After setting everything up for the party, we placed Hazel Grace in her special chair. We placed the tiara and sash on her. She immediately began screaming and tore both the tiara and sash off. My little princess had turned into a Drama Queen. We finally calmed her down enough so that we could place the Lamb Smash Cake in front of her. Hazel Grace took one look, kicked her chubby little leg into the backside of the cake and starting screaming again complete with REAL tears following down her face. I think she was traumatized by the ugly creature in front of her. Oh well, I tried. Throughout the party, my little “Princess” wanted nothing to do with anything-no tiara, no sash, no cake, no ice cream (who doesn’t like ice cream! ), and no presents. The only thing that pleased Hazel Grace were her old toys which she had been playing with since Christmas. Oh well, this little girl will always know that she is loved whether she likes tiaras and the color pink. As I ponder the events of the day, I began to see a slight parallel with church members. Our husbands try follow the Lord’s leadership and plan worship services, events, etc. However, regardless of how biblical the sermon is, how uplifting and worshipful the music is, how successful the church events are, there is always that one person who refuses to take part in any of it. Instead, they sit frowning and refuse to sing no matter what type of music is played. Instead of listening for God’s message, they checked their watch or sleep during the sermon. Instead of learning in their small group time, it becomes a place for them to talk about “the good old days.” Our church wide fellowships and events are not for them because there are too many “outsiders” there and the program doesn’t appeal to them. I firmly believe these people are missing out. They would rather pout, cry, and cause drama than look for what God is doing in their midst. A church can have a top-notch staff, terrific music, outstanding programs and events, but you will never please everyone. That is when you must love that person like Christ loves us and say, “Oh well, we did our best” and continue to follow the Lord’s leadership. I always look forward to spending time with my fellow sisters in ministry. In the association that I am a part of here in the Little Rock, Arkansas area, we have a group of 15-20 ladies who meet once a month. There is always laughter, good food, more laughter and lots of chocolate. When we gather, we plan for fun. Just this month we met at one wife’s home and she prepared a wonderful soup meal for us. All the rest of us had to do was show up with our leftover Christmas “junk” and share it. As we sat around the table there was no planned program. Since our last meeting almost two months ago, we simply caught up on each other’s lives. (Because ministers’ wives CANNOT squeeze another event in during the month of December, we take that month off). *We represented a variety of beautiful skin tones but what really made each lady beautiful was the love of Jesus oozing from inside. *We come from different backgrounds from around the nation. *God uniquely designed each of us to be our husband’s perfect helpmate in ministry. *We serve in large churches, small churches, new church plants but the common denominator is seeing lost souls won for Christ. *Our churches are located in different areas around our metroplex-rural, suburb, downtown-and our churches range from very small to very large congregations. *Our ladies are school teachers, nurses, stay-at-home moms, preschool teachers, business professionals, college professors, and more. * We represent moms of preschoolers, grade schoolers, high schoolers, college students and grown independent adult children. Some of us have even graduated to being grandparents. I could go on with my list but I think you get the idea. This group of ladies is not a click. We are a group of wives who are married to men in the ministry. We are a group of ladies who understand the unique roll of a minister’s wife. We understand the glory days of ministry and we have fought through the yucky days of ministry life. We struggle to raise our families, at times endure financial hardship, and so much more. We serve alongside our husbands because we are called to be God’s cheerleader for our men. People often ask me why I attend this fellowship or why I have been part of others like it. My response is always the same. It is the one place that I can remove my ministry wife mask and be myself. It is the one place where other ladies can encourage me and provide laughter to my soul. It is the place where there is no competition between churches (there never should be) and we can come together in one accord. I have also been asked what makes a group of ladies from different backgrounds and churches come together. My answer is that we all have a common bond. It is the bond of having Jesus as our Savior. My sisters, I know that we are a little over two weeks into a brand-new year, but I wanted to give you a new year greeting. Throughout January I’m seeing people for the first time this year, and I love to wish them a happy new year as well. A new year brings such hope and promise. Maybe there were some things you left undone from 2017, it’s a new year! Perhaps there were some relationships that you did not get a chance to mend, it’s a new year! Unfortunately, those bad habits you vowed to stop doing are still around, it’s a new year! Whatever you want to do over, makeover, or start over, this is your chance. Of course, we don’t have to wait until a new year to make adjustments in our lives. Yet it seems to be a good place to start. This year in my church we were issued a challenge to learn a Bible verse a week. I excitedly took the challenge because memorizing Scripture is one discipline that I have loved to do, but over the years I’ve started and stopped so many times. Sometimes, it is easy to get a verse in our hearts by meditating on it over and over again. Through life circumstances, the Holy Spirit will put certain verses on our minds that truly comfort us as we go through trials and tribulations. I plan to intently search the Word of God for verses or even passages that will help transform my life in 2018. I don’t want to learn the verses, just to have a bunch of Scriptures floating around in my head. No, I want the Bible to transform how I think, act, and speak! It is not surprising that the first verse I picked out for week one was Philippians 3:13-14. I thought about this verse a lot before the calendar rolled over. Why, because it truly speaks to pressing on in spite of past failures, mistakes, heartaches, and any “unfinished business” in my life. I love the idea of leaving what is behind and pressing forward to what is ahead. It speaks of hope, and our ultimate goal is to be conformed more and more into the image of Christ, who is our hope. Ladies, would you like to take this challenge with me, learning at least one verse a week in 2018? Perhaps you have some favorite verses or passages you want to sink deep into your soul. I guarantee you that it will not be time wasted, and you will be drawn into a deeper relationship with our Savior! So, as we continue into a new year, get into God’s Word, and whatever didn’t get done in 2017, leave it behind! Twenty-one years ago, this coming Sunday, was our first Sunday at Whites Creek Baptist Church. Our church is doing GREAT. By the looks of this picture, our church survived better than we did.................21 years puts lots of wrinkles, weight and less hair on a person. We are right where God wants us to be and we can not think of a place we would rather be. We are looking forward to more years. 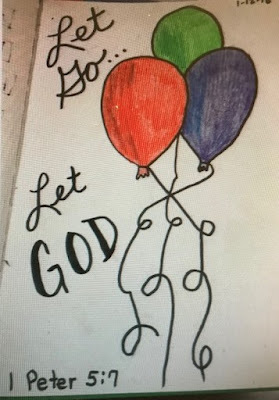 Today's Bible Journal................LET GO....LET GOD! Just PRAY.....and Let it Go! Anyway.....I started January determined that I was going to stay POSITIVE and I was going to avoid negative people who pull me down. No matter how hard I tried.....this "sandpaper" is everywhere. .....sanding away. It doesn't help that my sandpaper is causing disgruntlement throughout the school that I work in. Everyone is talking and complaining....................even our bosses are at their rope's end. She is the person that "the rules do not apply to"......"it is never her fault"....and she spends all her time trying to figure out how to get out of work and how to get rid of her students................................and she is many times successful. I must confess.................I have been guilty of complaining and getting upset to the point that it even affects my ability to do my job. I have been guilty of stretching the POSITIVE thing................by saying..........I'm POSITIVE She is lazy.................I'm POSITIVE she is driving me crazy....etc. I have PRAYED for her. I have prayed that she would not rub me raw. "WAIT.....us getting upset is not changing anything and it is not hurting anyone but US. It is keeping us all upset and bent out of shape....and putting us all in bad moods." I told them that "this person" claims to be a Christian....so if she is.........................she will one day get her just reward. You can not continue to lie, manipulate and do wrong without it coming back to you. AND.....in the meantime, we are allowing SATAN to do EXACTLY what he has set out to do......................................Satan is using this "weak co-worker" to keep all of us upset, discouraged and even angry...............................because as long as we have those feelings.....God is not getting the glory. WOW......that just came out of nowhere.....and oh, it spoke to my heart. My co-workers all agreed..............they had not looked at it in that way....................Satan was using the situation to hinder even our walk with Christ. Talk about praying.........................I prayed all the way home for God to forgive me for allowing Satan to have the temporary victory. I prayed that God would help me to forgive "my sandpaper" because I do not answer for her.................I only answer for ME. I am human.....and I will slip...............................but this is my goal. The irony of this is...............if she had been a sandpaper in our church.........I would have recognized Satan at work...................but because it was not at church............I was a slow learner.............GOD HAD TO SHOW ME. We can't change anything.............but GOD CAN!!! 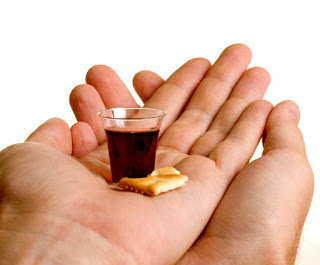 As Baptist, we normally partake of the Lord's Supper quarterly or any other designated time that is set aside. HOWEVER.....on New Year's Eve morning, our church partook of the Lord's Supper and I was able to view it from a different perspective. 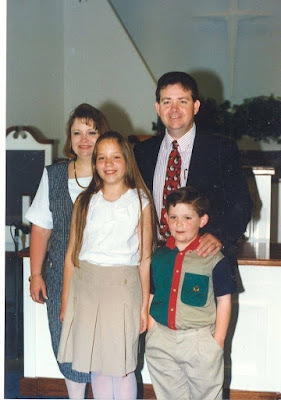 Our grandchildren spent the night with us and went to church with us that morning. Our grandchildren go to First Baptist Church of Cleveland, TN, which is a very large church, therefore, they are always in Children's Church and have never witnessed the Lord's Supper. I had already wondered how I was going to handle it when they wanted juice and bread too.................................................but NOTHING prepared me for the QUESTIONS. Never once did they ask to also participate. BUT....they both asked a minimum of a million questions. Why and how come, etc. I answered the questions the best I could and during the entire ceremony, I explained what we were doing and why we were doing it..........................in a child's version. Finally................Cameron asked......."Mimi, if the bread is Jesus's pretend body......and we love Jesus...............Why do We Eat Him Up?" Whewww...............hard question. Because, remember....in a preschoolers mind, eating someone is NOT loving them.....bad people eat the good people. I stumbled and hope I made sense to him. I just told him that we were not really eating his body..............we were eating the bread so we could remember his body....and remember when he died on the cross for us.............................because we love him so, we want to REMEMBER HIM so eating the bread is just to help us remember.....just like drinking the juice is really not blood, but it helps us to remember that Jesus died for us. Whewww.............that was enough to satisfy him....so I got lucky this time. 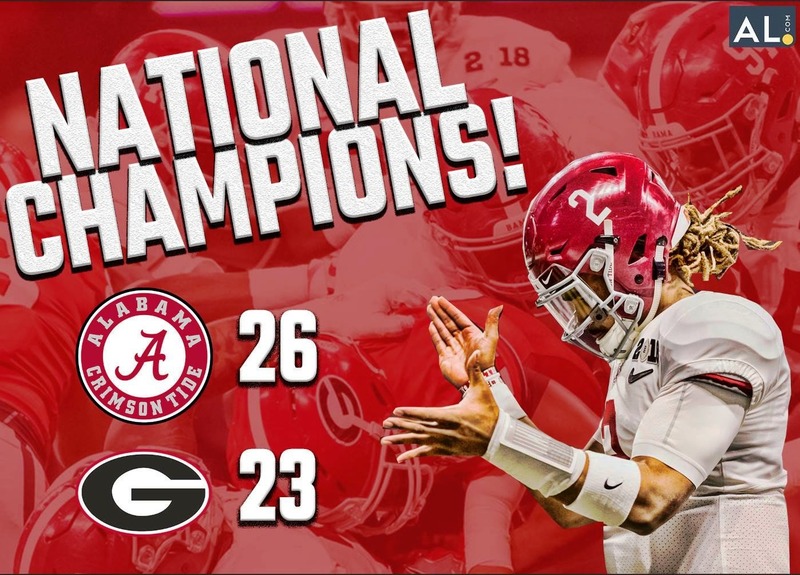 I was just wayyyyy toooo tired to blog about the National Football Championship game yesterday. Whether you are "Trump" supporter or NOT.....didn't it feel good to watch our president sing the National Anthem at the game? Also.........I loved how several times the cameras zoomed in on the Alabama team kneeling and praying before the game. Whether you were rooting for Bama or the Dawgs............there are two guys that need recognition. Don't you wish that everyone would just do THEIR job and if someone else could do it better, step aside and cheer them on?? But, many times, whether in our secular worlds or in our churches, we see JEALOUSY............which is NOTHING but SIN. Second....Tua Tagovailoa, as a freshmen had bragging rights..........he was the player of the game. BUT....never once did he take credit for his talent...............over and over America heard him say, "I want to Thank my God.....and I give Him all of the credit....I can do all things through Christ who strengthens me..."
Sometimes people get caught up in their glory and don't stop to realize that nothing is possible without Christ..... It is refreshing to hear someone give credit where credit goes. I've already heard the critics............talking about the two guys from Alabama that showed poor sportsmanship. They are proof that you will always find bad apples in the barrel. Also....Satan is using those two guys to keep everyone's focus off the PRAYING, the TEAM-WORK & SPORTSMANSHIP and the PRAISE GOD. 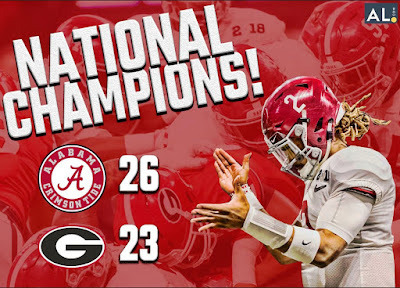 Monday night............was a great night all around................because as many of you know....we are from Alabama......................ROLL TIDE. Now that the holidays are over, we are trying to slowly de-clutter our house. We are downsizing and trying to remove things that are not needed. After 38 years of marriage and 23 of those years is THIS house.....it is easy to accumulate lots of clutter. We always think....well, I may need that for something, etc........when in reality, if you do need it, chances are you will not be able to find it. So...........we are slowly, one room at a time, attempting to de-clutter. As each area gets completed, it feels soooooooooooo good. Got me to thinking............our "ministry" lives get cluttered over the years too. As leaders, we continue to take over duties, etc. that are expected or that we just want to do, etc. Before you know it...........your ministry life is a mess too. It's January 2018...........so time to de-clutter. If you are like me and a list maker.............go that route.....or do whatever works best for you. Make a physical or mental list of things in the ministry that are important.....things that are a MUST. Put the things in order. Remember you and your spouse CAN NOT DO IT ALL.....decide WHAT you will do and let someone else do the other things, or as Elsea says....LET IT GO. The de-clutter can also go for your "Spiritual Life" too. Clutter is just Satan's way of discouraging us whether it is in our HOME....or our MINISTRY....or our SPIRITUAL LIFE....or whatever. DE-CLUTTER....................Don't Allow SATAN the opportunity to drag you down. 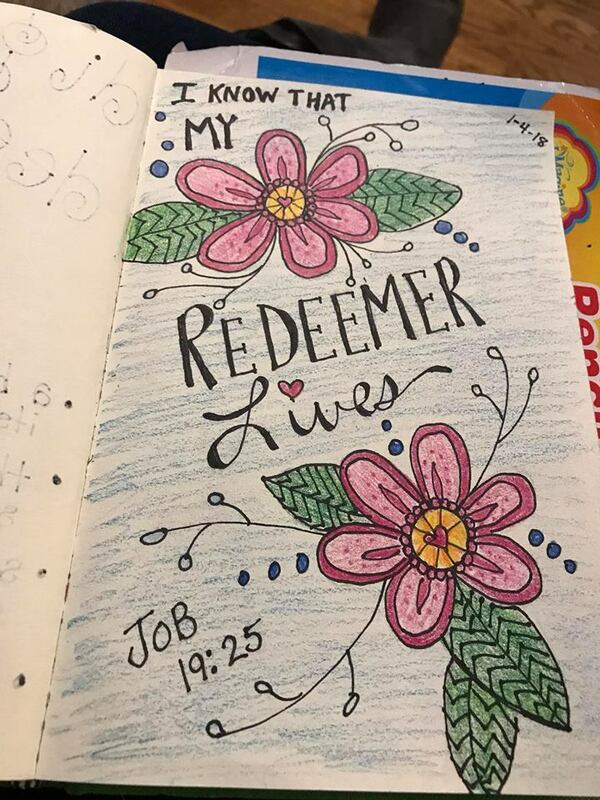 What do you do when the temperatures are way below freezing....you are school teacher and your school is closed and you are just wanting a lazy morning...................you "Redneck Bible Journal".......Smile. I had put my Bible Journaling aside during the holidays because of the hectic schedules..................last Thursday, I decided it was the PERFECT time to get back into the routine. It is VERY relaxing and addictive...............but I can think of much worse things to be addicted to. Smile. In my daughter and daughter-in-laws stockings were the drawing book and colored pencils to begin their journaling. My daughter has discovered that she really enjoys it and is busy creating her own designs, etc. to go with her favorite Bible verses. So.....everyone is posting New Year's Resolutions..............it does not make a difference of HOW OLD or HOW YOUNG you are...............you can Bible Journal. And, I am proof....ANYONE can do it. When you finish a book......................you will have an entire book of your favorite Bible verses....or Bible Verses that touched you on particular days. Ladies..............run to Walmart...........purchase a 5x7 Sketch book, fine point Sharpies and Crayola twistable colored pencils....open up Pinterest for ideas.....and get started. I would LOVE for you to share your ideas and finshed product. Many of you know from my blog posts that I am a chocoholic, beach lover who loves Jesus. You know I am a pastor’s wife, mother, and grandmother. You probably have figured out that I am just a bit “crazy” when it comes to having fun with my girlfriends. However, there is one thing you do not know about me. I am a people pleaser and I have a fear of failure. From childhood to present, I have always known this about myself. Over the years, I have learned to face many failures with grace and know that the Lord loves me regardless. It is still disappointing to me to not meet the expectations of people around me. However, I realized something this week. It may seem so silly to you but that’s ok. I realized that my fear of failure and people pleasing is a sin from Satan. It is a lie from the pits of hell. The only person I have to be concerned about pleasing is the Lord. And let’s face it, even if we do disappoint him with our sinful nature, the Lord loves us with a never-ending love. There maybe one of you out there in cyberspace who is fearful of taking the next step for the Lord. Maybe you and your husband feel called to go on the mission field far away from family and friends. Maybe you to are a people pleaser and afraid of failure. I challenge you to pray and seek the Lord’s will. Seek out a godly person who can listen to your story and give godly wisdom. As for me, I have accepted the challenge to face my fear of people pleasing and failure head on. I have a plan and I am giving it to the Lord. So, sisters, I am selfishly asking for your prayers and I follow the Lord’s leading. As a school aged child, I loved getting a new diary every year at Christmas. I loved to write my thoughts and deepest secrets in it. Over the years my diaries went from an elementary girl’s silliness to a teenage girl’s joys and heartaches of dating. My diaries reflected my life at the time and how each year revealed a hope for a clean slate. Today, I love starting a new journal every year. To me it represents a fresh start and anticipation of something new. 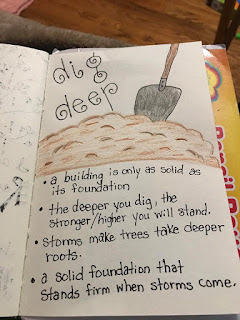 Although I no longer spill out childhood secrets, I do pen my thoughts from my quiet time. Sometimes God provides insight to an issue or decision that must be made. Other times I simply write a scripture in my journal. Of course, there are tons of prayers for a person who has been laid on my heart that day. In addition, each year my journal reveals a little more of what God is teaching me and who he is. I am glad I serve a Heaven Fatherly who allows me to start afresh daily with a clean slate. How about you?